Four years ago in our R&R testing and evaluation and focus groups of how to make the best pillow in the world we considered each of the following. We’ll give you our quick reason why we chose to go in the opposite direction. Buckwheat – This is actually a thing and not just a distant memory from an old SNL skit. “Buckwheat pillows are filled with hulls, or the husk-like outer shell found around buckwheat kernels.” We actually made 4-5 of these in the beginning as we heard some great things about their properties. We actually still have 100 lbs of it in the corner of our warehouse. That little history lesson will tell you a bit of what we think about pillows with Buckwheat. The key area that isn’t listed on Tuck was they are noisy and crunchy. We just couldn’t get the comfort, support and ease of sleep to work for us and those who tested it. Down or Feathers – “The term ‘down’ refers to the plumage (but not the feathers) of ducks or geese.” We never even went to testing them for a couple of reasons. Number one is that we didn’t like the process of sterilization of down and feathers. The cleaners and degreasers used were not something we wanted to deal with. Ultimately it came down to the 2nd reason. We found that most people interviewed and reviewed didn’t find the pillows supportive enough, especially for the amount of money they spent. Down Alternatives – “Most ‘down alternative’ pillows are made from polyester fibers designed to mimic the soft, lightweight qualities of genuine down.” We considered these to be polyester so we didn’t even go there. We’ll address that below. Latex – “Latex is a natural substance that is extracted from the sap of rubber trees and whipped into a frothy material that conforms closely.” This is one of the natural materials we landed on. But we have our own unique perspective on latex pillows. We’ll address why we chose our version of latex below and how that is unique to most others. 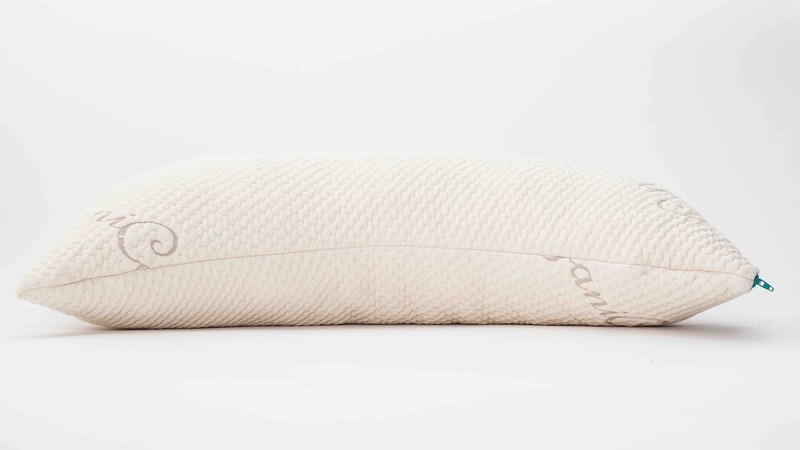 Memory Foam – “Memory foam (also known as viscoelastic polyurethane foam) is designed to conform deeply and create a cradle-shaped impression around the sleeper’s head, neck and shoulders.” Ultimately it came down to a philosophy of non-negotiables for our Everpillow. We didn’t want to use any poly foams, petroleum based foams or gel foams regardless of how they are described. We kept getting feedback in our innovating stages that memory foam is hot, smelly, and really unhealthy. It didn’t matter if the pillow had a block of memory foam or shredded, we were not going to go there. Polyester – “Polyester pillows (as the name implies) are entirely filled with polyester fibers.” Much like memory foam this type of material never entered into our discussion. You can find these at all your big box stores, grocery stores, mattress stores and even online claiming it might be your pillow or my pillow. These pillows you can find for $3 up to $100. It all depends on the TV commercials, ads and fancy marketing to get you to pay more for a basic poly pillow. We didn’t go here because they are fake, cheap, non supportive and really don’t provide the comfort you need and want. Natural and Organic – This all natural materials can be considered cotton, wool, silk and natural latex is under this category in this as well. 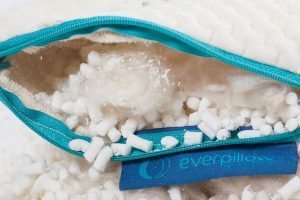 Everpillow uses all natural materials. We did decide to not use organic materials as the certification process of each is often super expensive, not beneficial to the consumer or in some cases a complete sham. We did try wool and cotton but found the materials to be dense and it didn’t interact with the latex punches we use in Everpillow. There are lots of latex molded pillows in this shape or that shape. We had to eliminate those types of latex pillows because we knew our pillows had to be customizable and adjustable. We were offered like many others to use shredded latex pieces. These come from larger blocks of latex and put in a shredding machine. We found them to be clumpy because of the hard rectangular and square pieces didn’t flow, move and also provide the support and softness we wanted. We landed on a commodity that is a bye product of latex toppers. After the making of a latex topper of 1, 2 and 3 cm thick they are punch with holes. Those holes make up Everpillow’s latex punches or as some refer, noodles. Kapok Silk has been making a come back in the world of sleep and comfort. It is super silky, soft but also provides wonderful support. It comes from the seedpod of the java cotton tree and is valued for its natural properties. Kapok Silk and Natural Latex Punches mixed together….A Pillow of your dreams. We offer 3 types of fill. 100% Latex fill – super floppy yet supportive. 100% Kapok Silk – Soft, airy, flows with your head. Blend of Latex and Kapok – This is our most popular pillow tested and sold. We recommend this if you want to start on your journey for the best all natural pillow in the world. We found these two all natural materials work so well with each other. Somewhat of a match made in heaven. The latex punches blended with the kapok silk provides one of the most supportive, non flattening yet comfortable, cool sleeping and soft pillows in the world. What we have found is that pillows with these features of Everpillow are all over $100 and some up to $200. We know we have found the pillow of your dreams and know you’ll have an infinitely better sleep experience. We made it….now you go perfect it.